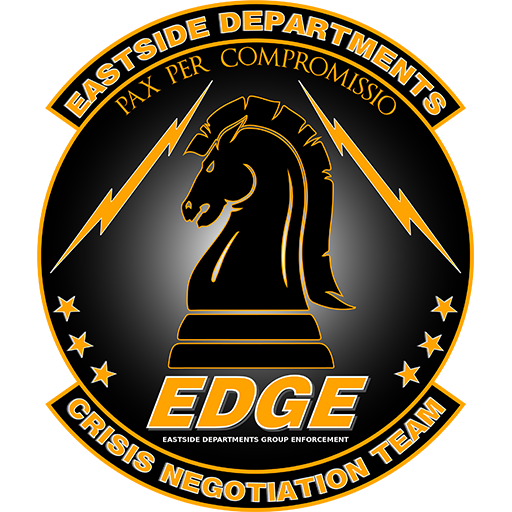 The EDGE Crisis Negotiation Team was organized back in October of 2015. It currently consists of 10 police officers, which are drawn from various ranks within the EDGE Communities of Beachwood, Euclid, Shaker Heights, South Euclid, University Heights and Cleveland Heights. Members are chosen for their demeanor, communication skills and their ability to remain calm in stressful situations. Team members undergo extensive training centered around problem resolution, and psychological tactics aimed at convincing the subjects involved to resolve the situation peacefully. The mission of the team is to attempt to bring a peaceful resolution to various crisis situations, such as hostage taking, barricaded subjects, suicidal subjects, or other related tactical scenarios. During these crisis situations, the team is deployed alongside the EDGE SWAT Team. Team priorities are focused on the preservation of life, apprehension of the subject, and the protection of property. The following are just a few examples of the team’s recent deployments. In July of 2017, members of the the Crisis Negotiation Team were summoned to Shaker Heights to assist an adult male who was contemplating suicide. Prior to officers’ arrival, this male had been posting hopeless messages on his social media accounts, along with photos of himself seated on the edge of a tall building with his legs dangling off. The temperature on the roof was over 95 degrees, and the noise from the rooftop air conditioners initially made it very difficult to speak with the male. After approximately two hours, negotiators finally established a dialogue with the male and learned that he was distraught because his dreams of making it big in Hollywood were not coming to fruition. A while later, negotiators were able to convince the male to come down from the rooftop peacefully. In August of 2017, members of the the Crisis Negotiation Team were assigned to a call of a man armed with a handgun, who indicated to his wife that he was on his way to kill her, her boyfriend, and the four children they have in common. He was then going to commit suicide afterwards. Negotiators were able to establish a Facetime call to the subject from his wife’s cell phone and get him to pull over and talk. During the conversation, officers were able to determine his location from the background scenery on the phone call, and subsequently located him in a parking lot in Shaker Heights. The area was then surrounded by tactical officers from the EDGE SWAT Team, while negotiators continued to speak with him. After a short while, the male surrendered to the negotiators without further incident.